Create responsive based website for easy reading and navigation with minimal re-sizing, panning and scrolling that fits multiple screen sizes. Measure how many visitors you have, the referral sources, keywords used, etc. Showcase products on Facebook. Drive traffic to your website. Beautifully crafted mobile shopping experience created specifically for customers who browse and purchase from smartphone and tablet devices. Accept credit cards online (support for 50+ merchant account gateways). Accept PayPal, Google Checkout. UPS, USPS, FedEx. Or define your own shipping rates. 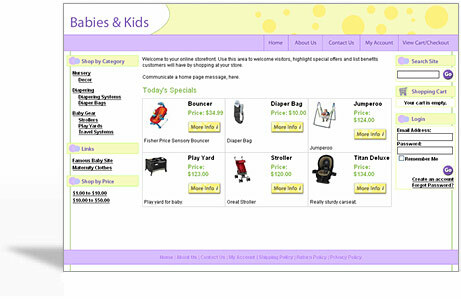 See top customers, profit margins, inventory levels, best selling products, customer locations, popular searches and more. SAS Type II certified Data Center with geographically diverse points of presence for high speed webstore performance. Level 1 certified PCI-DSS compliant for payment card data security compliance. 2 concepts, 2 additional revisions. Web format. 5 Designers, 5-10 concepts, unlimited revisions. Web and print formats. Suitable for print on business cards, stationary, brochures, flyers, signs, billboards,packaging, direct marketing & postcard, vehicle graphics, embroidered & silk screen. Contact Sales for a FREE quote today!